Executive Director Rachna Khare welcomed two Daya clients and Daya counselor, Hareema Mela to the stage for an open discussion about the clients’ experiences and the role that Daya played in the recovery. 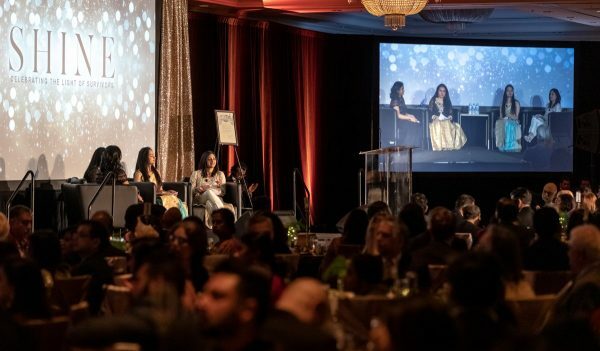 HOUSTON: Chaired by Daya Board Members, Aparna Asthana, Annu Naik, and Shamza Matin on March 31, 2019, Daya held Shine – Celebrating the Light of Survivors to raise funds to support South Asian victims of domestic and sexual violence in Houston. 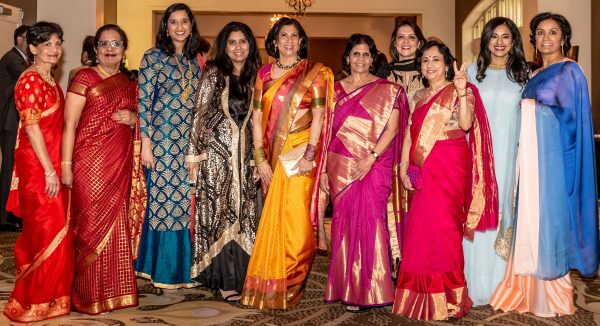 As a result of outreach by Honorary Event Chairs Salma and Riaz Siddiqi, and Sandhya and Naresh Sabhnani, this year’s sold out gala welcomed over 600 community members. The program was led by emcee, Vikas Shah, MBE, an entrepreneur and professor who traveled for the event from Manchester. Against a stunning backdrop of twinkling lights, Daya Board President, Sheela Rao welcomed the audience and acknowledged the many staff, board members, and volunteers that make up the Daya Family. She gave special thanks to Daya’s partners and funders that allow Daya to do their work. Mr. Shah then read an official proclamation from the Mayor’s Office, naming March 31, 2019 “Daya Day” in the City of Houston. Executive Director, Rachna Khare spoke of the complex challenges and barriers that South Asian survivors face when seeking help. She welcomed two Daya clients and Daya counselor, Hareema Mela to the stage for an open discussion about the clients’ experiences and the role that Daya played in the recovery. One client discussed the barriers she faced in shelter and mainstream agencies. A year of rental assistance from Daya has allowed the client to rebuild her life. She now has a full-time job and can independently take care of her four children. The second client spoke of the in-law abuse she experienced and the impact the abuse had on her own family in India. Through mental health counseling at Daya, she was able to rebuild her self-confidence and is now living independently and is finishing dental school. Ms. Khare challenged the audience to take ownership of domestic violence as a public health crisis. Mr. Shah then took the stage to illustrate how community donations impact in the life of a survivor. A donation of $1000 provides six months of trauma-based professional counseling, $2500 gives a legal retainer fee for immigration and family law cases, and $10,000 provides an entire year of rental assistance for a client and her children. After dinner, filmmaker and activist, Leslee Udwin, took the stage. Ms. Udwin spoke passionately about the making of her film, India’s Daughter. Ms. Udwin introduced the audience to Think Equal, her initiative to teach empathy and equality to children in the formative, developmental years. Ms. Udwin ended her inspirational speech with a call to action, urging the audience to shine the light on domestic violence in our community. Daya is aiming to raise $400,000 for the gala. To donate, please go to https://www.dayahouston.org/what-your-dollars-can-do. Daya empowers south Asian survivors who are trying to break the cycle of domestic and sexual violence and reclaim their lives.